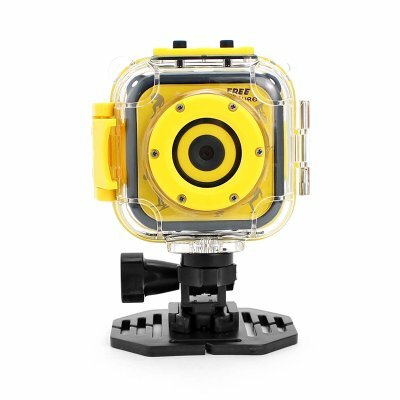 Successfully Added K1 Kids Action Camera - CMOS Sensor, 720p Video, 5MP Pictures, 80-Degree Lens, 1.77-Inch Display, 500mAh Battery, Time Stamp to your Shopping Cart. The K1 Kids Camera is a great gadget for your son or daughter that allows them to shoot HD video and crisp 5MP pictures of all their outdoor adventures. Coming with a number of hooks and clips, this action camera can be easily attached to your child’s bike or helmet. Naturally, it can also be used as a regular handheld camera. The child action camera itself features a colorful design. It is light in weight and compact in size which makes it easy to operate for your child. The camera even comes with a waterproof casing that protects it against dirt, dust, and water. Therefore, you won’t have to worry about your child accidentally damaging it while playing outside. With its 1.3MP CMOS sensor, this sports action camera allows you to shoot crisp 5MP pictures and HD video. You’ll furthermore be treated to an 80-degree viewing angle that allows you to record all that lies ahead. It comes with a built-in microphone and speaker that lets you record both sound and audio. On the sports camera’s 1.77-Inch display, you’ll be able to watch back previous recordings on the spot. With its 500mAh battery, the K1 kid’s camera lets your child shoot pictures and video for up to 40 minutes straight without needing to recharge. The K1 Kids Camera comes with a 12 months warranty, brought to you by the leader in electronic devices as well as wholesale action cameras..